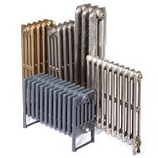 Period Style are exclusive distributors of Ottinetti Radiator Valves. Ottinetti, based in Italy, supplies a wide range of traditional radiator valves for design radiators, including manual valves, thermostatically-controlled valves. Ottinetti Valves have a 7 year guarantee and are made in Europe using traditional techniques and market leading engineering tollerances. These high-quality valves are available in a wide range of different finishes, including chrome, brushed nickel and brass, optionally with coloured components.